Hemispheres: Geometry in Borax, Boron Mine, California. Map and News. Elearning. 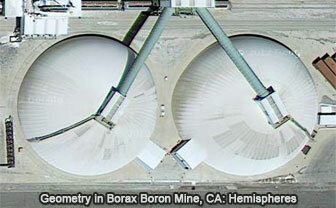 Explore the geometry of the hemispheres in Borax, Boron Mine, CA through Google satellite imagery. To Pan: click and drag the map. Take advantage of the zoom bars. Rio Tinto Borax operates California's largest open pit mine in Boron, California - one of the richest borate deposits on the planet. The company supplies nearly half the world's demand for refined borates, minerals essential to life and modern living.